Welcome to New Working Paper Series Editors Tim Wyman-McCarthy and Sigrun Schaumburg-Müller! We are delighted to welcome our new editors for the Network’s Working Paper Series, Tim Wyman-McCarthy and Sigrun Schaumburg-Müller (bios below)! We are deeply appreciative to our outgoing editors, Michelle Bellino and Cathlin Goulding, and wish them continued success in their academic endeavors. If you are interested in submitting a paper to the series, please e-mail Tim and Sigrun at dialogues@columbia.edu. Tim Wyman-McCarthy is a PhD student in the Department of Rhetoric at the University of California, Berkeley, where he researches human rights discourse at the intersection of law, political theory, international relations, and policy. Prior to this, Tim worked for the Institute for the Study of Human Rights at Columbia University, where he was program coordinator for the Alliance for Historical Dialogue and Accountability and the Indigenous Peoples’ Rights Program. He has interned in the Disability Rights Division of Human Rights Watch, edited RightsViews (Columbia’s human rights blog), and has worked as a research assistant, teaching assistant, and copy editor across the social sciences and humanities. Tim received his BA in History and Literature from Queen’s University, Canada, and a Masters in English Language and Literature from Oxford University, UK, where he concentrated on South African writing. He then completed his Masters in Human Rights Studies at Columbia University, where his research focused on Indigenous rights and settler colonialism. As incoming co-editor of the Network’s working paper series, Tim is delighted to put his editorial skills to work and to continue his work in historical dialogue and related fields. Sigrun Schaumburg-Müller holds a Masters degree in International Studies, where her research focused on the role and evolution of memory narratives in El Salvador in the aftermath of that country’s civil war. Until recently, Sigrun lived in Bogota, Colombia, researching the country’s transition to peace and working as an editor and writer for Bogota Post. She previously held an internship at the NGO CRIPDES in San Salvador, and she has also lived and worked in Argentina, focusing her studies on transitional justice in Latin America. Sigrun holds a BA in Comparative Literature from Aarhus University and she plans to pursue a PhD within the field of transitional justice and social memory in Latin America. Sigrun participated in the 2016 Historical Dialogues, Justice and Memory Network conference, held at the University of Amsterdam, and has followed the Network’s activities and the field of historical dialogue with keen interest. Aside from her editorial position in Colombia, Sigrun has served as the editor of Visir Faculty Magazine in Aarhus, and she is excited to serve as co-editor of the Network’s working paper series. 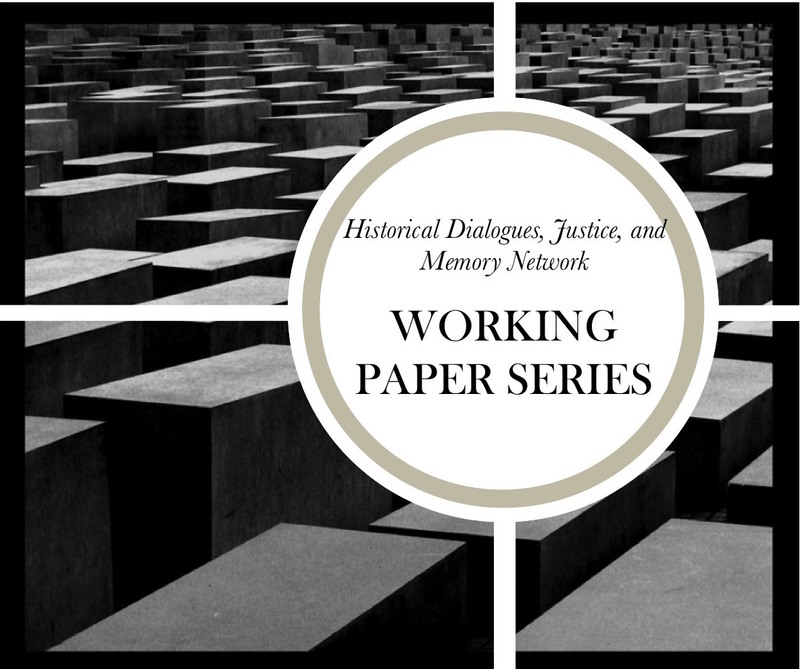 The Historical Dialogues, Justice and Memory Network launched its Working Paper (WP) Series in January 2014. The series editors are looking for unpublished texts that emerging scholars, practitioners and others are willing to “workshop” within our intellectual community on issues of historical dialogue, historical and transitional justice, and public and social memory. This is a unique format for online working papers, with plenty of opportunities for discussion and feedback. We will feature your WP on the Network website for a period of approximately two months, promoting the series on our bimonthly newsletter, blog, Twitter, and Facebook pages, encouraging members to read your paper and contribute to an online discussion. Additionally, we invite our community to act as “discussants” for each WP, aiming for responses from junior/emerging scholars, practitioners, and more established scholars. The goal is that you will receive useful feedback for revision. We hope comments and questions ignite further discussion among Network members. The author is encouraged to be an active participant in the online conversation as well. Authors are most welcome to submit the names and contact information of discussants that they would like to see comment on your work, since this is not a formal peer review process. We will contact them and see whether they are willing to serve as discussants and how it will fit into our timeline. For submissions, there are no restrictions on topic, length, or citation format, though we recommend fewer than 30 pages in length and we require the use of a consistent citation method with complete references. There are no restrictions on author affiliation, training, or experience, and your WP can be a policy memo, a practice-oriented program outline, or a scholarly contribution. Copyright will remain with the author, so that posting in the WP series will not prevent you from pursuing publication with the same paper at a later time. Your paper will be archived once a new WP is posted, or if you request its removal. The discussion around your paper will remain accessible. The working paper series is an excellent opportunity to receive interdisciplinary feedback on your ideas and the quality of your writing. We encourage you to send questions and Working Paper submissions to co-editors Tim Wyman-McCarthy and Sigrun Schaumburg-Müller at dialogues@columbia.edu. And please check our repository of Working Papers!